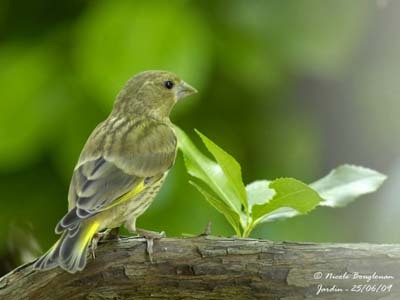 European Greenfinch is a stocky bird with plump body. This species often frequents the bird-feeders in winter, and is particularly fond of sunflower seeds. 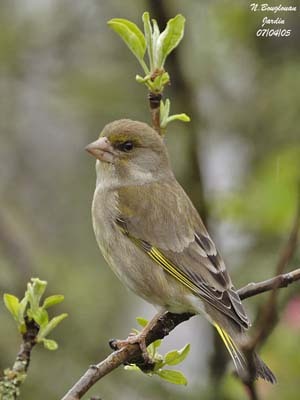 Adult male in breeding plumage is olive-green washed yellow on the upperparts. Upperwings are darker. Flight feathers are rather grey with bright yellow edges on primaries. When the wings are closed, we can see a conspicuous yellow patch. Tail is grey, with yellow patch at base of external rectrices. Head is olive-green. The strong, conical bill is horn-coloured. Eyes are dark brown with brown lores. Legs and feet are pinkish. Adult male in winter plumage is duller. On the head, we can see a pale grey patch on head-sides, and an indistinct pale grey collar on the foreneck. Forehead and eye’s area are rather green. Adult female is duller, browner overall. The yellow wing patches are less conspicuous. Her plumage is slightly washed green or yellow in the centre of belly. Juvenile resembles female but with greyer plumage, heavily streaked darker overall. It has weak yellow edges on primary and tail feathers. European Greenfinch utters rapid “djururut” in flight. We can also hear a soft “tsooeet” and a brief “chup”. Song is often given during circular flight. It is a series of twittering phrases, ending in long, nasal “dzweeeee”. This more or less melodious song uttered by the male accompanies the butterfly-like flight display. 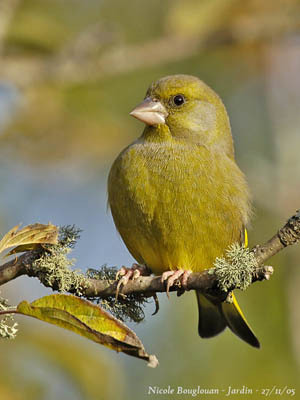 European Greenfinch frequents open woodlands and edges, bushy areas, gardens and farmlands. It is well adapted to human presence. The northern populations migrate southwards in winter, and frequent varied kinds of habitats, including the sea coasts. 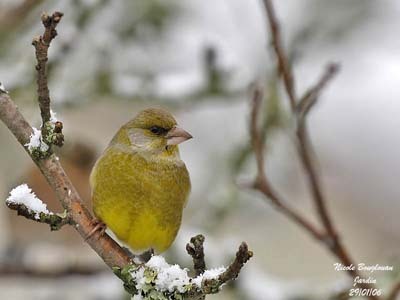 European Greenfinch is common and widespread throughout Europe, North Africa and south-west of Asia. The species has been introduced into New Zealand. 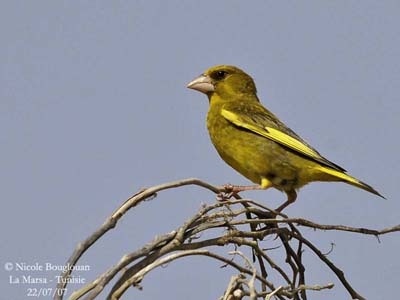 European Greenfinch feeds mainly on sunflower seeds. 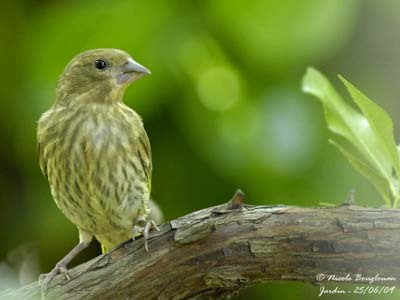 It often frequents the bird-feeders and it is very common in gardens. This bird is very agile and is able to take food from hanging feeders. It also takes berries and buds, and seeds of several other plants. In winter, flocks feed on the ground where the birds easily hop among grasses. The powerful bill allows these birds to feed large quantities of food every day. Great numbers may gather in cultivated areas, and they are sometimes a real problem for the seed-crops. 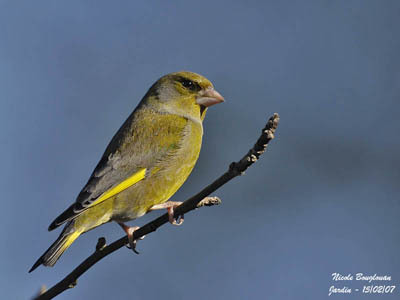 European Greenfinch male starts the flight displays as soon as March. During the breeding season, it performs a butterfly-like flight. The male follows a circling pattern with erratic, slow, bat-like wing beats. During this flight, it continuously utters its song. The pairs which are formed often perch high in trees, with the male always in open. 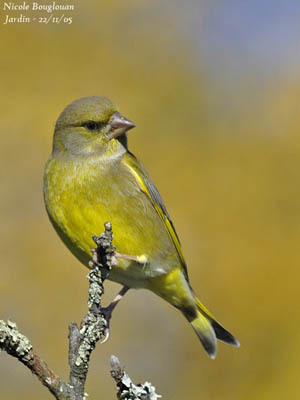 European Greenfinch is mostly sedentary, but several dispersions occur after the breeding season. The birds of the northernmost parts of the range may migrate southwards in winter. Usually, young birds move, but adults are rather resident in their range. 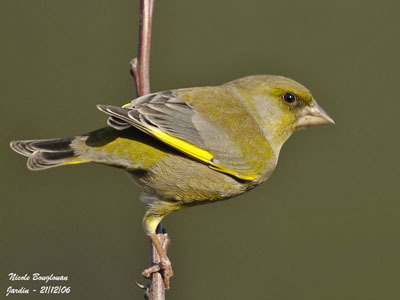 European Greenfinch has an undulating flight with alternated periods of active wing beats and glides with closed wings. The yellow patches on wings and tail are conspicuous in flight. Breeding season occurs in spring, starting in the second half of April, until August, with fledging young in late August. 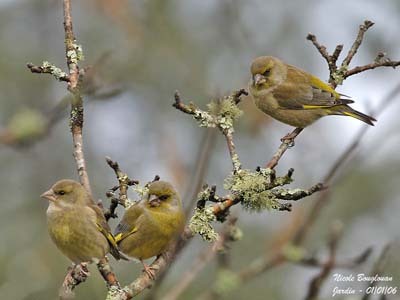 European Greenfinch is solitary nester, but it may sometimes nests in loose colonies where each pair defends its small territory. The nest is located in vegetation, bushes, climbing plants against walls, small shrubs with thick foliage, medium-sized trees, situated in parks and gardens within towns, or in the countryside. The nest is often in fork at relatively low height. It is a bulky nest, made with dried grasses and moss. The interior is lined with plant fibres, rootlets, fur, feathers and wool. Female lays 4-6 glossy pale blue or creamy-white eggs with a few reddish or purplish markings. Incubation lasts about 13-14days, by female. Male feeds her at nest during this period. Chicks are covered with thick, long, greyish-white down at hatching. They are fed on insect larvae by both adults during the first days, and later, by frequent regurgitated yellowish past of seeds. They leave the nest about 13 days later but they are not able to fly. Usually, they fledge 16-18 days after hatching. This species produces two or three broods per year. 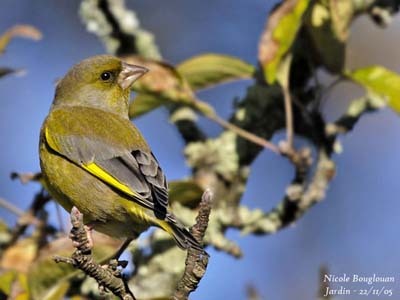 European Greenfinch feeds mainly on sunflower seeds, but it also takes seeds from varied other plants, buds, berries and insects during the nesting period. 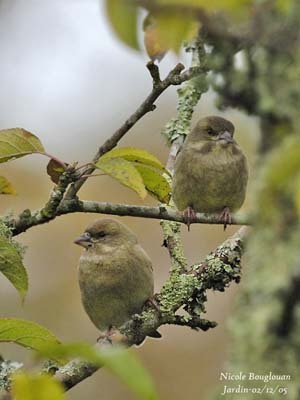 European Greenfinch’s populations suffered declines due to changes in agriculture practices. That is the main reason of the frequent presence of this species at bird feeders. However, this species is common and widespread in its range, and populations are not globally threatened at this moment.